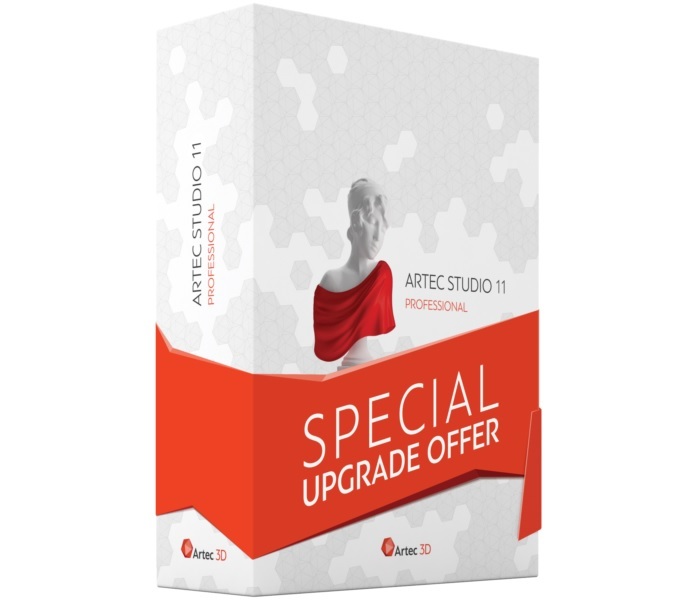 Upgrade to Artec Studio 11 with a hefty discount! Artec offers the latest version of its smart 3D scanning software at special prices for those who want to feel the true power of automatic data processing. Every new release of Artec Studio 3D scanning software comes with breakthrough features that simplify and speed up the creation of 3D models while ensuring the best possible quality of scans, and we would like all Artec users to take full advantage of the latest and most powerful set of tools that Artec Studio is equipped with. Through the end of 2016 we are offering users of Artec Studio 9 and 10 special prices for upgrading their licenses to Artec Studio 11 Professional. For those who wish to upgrade from AS 9 and 10, the standard price of 1,450 USD for 1 lifetime license of AS 11 Professional has been reduced to 1,200 USD and 600 USD respectively. Please proceed to the Artec online store, add 1 lifetime license of Artec Studio 11 Professional to the cart and go to Checkout. You will be redirected to your account on my.artec3d.com and will see the discounted price of upgrading your current license to AS 11. Artec Studio 11 has won a great deal of positive reviews from industry pros for its Autopilot mode that relieves the user of the need to choose how their data should be processed. Artec Studio 11 has won a great deal of positive reviews from industry pros for its Autopilot mode that relieves the user of the need to choose how their data should be processed – Autopilot asks them a few quick questions about the object they’ve just scanned and the type of 3D model they need, and then automatically builds an accurate 3D model. “Autopilot is really smart and efficient! It’s a great added value for the Artec solution,” said Alain Olivier, from the French company 3D Avenir specializing in additive manufacturing technologies for businesses. Along with Autopilot, Artec Studio 11 offers the possibility to process data manually and edit the scans’ geometry and texture with a selection of tools, such as the 2D and 3D erasers, texture brushes, the mesh simplification algorithm and more. We have revised all stages of data processing to see where timeframes could be cut down. We have revised all stages of data processing to see where timeframes could be cut down. One of the key operations that have been streamlined in Artec Studio 11 is the removal of the base the object was scanned on – now the floor or rotating table can be detected and deleted automatically. This feature is especially useful for larger projects, where it can save over 30 minutes of processing time. Artec 3D scanning technology is an integral part of new product design across a variety of industries, and we have made sure to straighten the scan to CAD path for engineers. Any model created in Artec Studio 11 can be landed in SOLIDWORKS, the #1 CAD solution in the world, at the click of the “Export to SOLIDWORKS” button, if you have Geomagic for SOLIDWORKS or DezignWorks plugins installed on your computer. Until the end of 2016 you can buy Artec 3D scanners and software bundled with the SOLIDWORKS plugins at great prices. If you want to find out more about Artec’s special offers, please contact us at sales@artec-group.com.